The "Taste The Stars" menu at the Four Seasons Resort in Costa Rica was developed with former NASA astronaut Franklin Chang Diaz. The dinner includes real meteorite sauce. A former NASA astronaut has brought a taste of space down to Earth while elevating the concept of space food to new heights. "The food I ate in space was not what you would call 'fine dining,'" Franklin Chang Diaz, a record-setting, seven-time shuttle mission specialist, observed. "In fact, eating was a challenge altogether." Franklin Chang Diaz, seen onboard the space shuttle Columbia in 1996, prepares a meal while floating weightless in space. Chang Diaz recently set out to answer those questions by working with the chefs at the Four Seasons Resort in his home country of Costa Rica. By blending astronomy with molecular gastronomy, they succeeded in creating a multi-course, space-influenced dinner, called "Taste the Stars." "What was really interesting to me was the idea of taking influences from what I saw and ate up there [in space] and getting the chefs to take it to the next level," Chang Diaz said in a video promoting the dinner. The tasting menu features molecular cooking techniques and unconventional ingredients, including a real meteorite. "One of our ideas was to include a rather unconventional ingredient on the menu — meteorite — which we actually made into a sauce," stated Chang Diaz. "So you can truly taste the stars." The "meteorite jus" factors into the dinner's fourth course, a surf and turf dish titled "Solar Effect" (each of the meal's courses has a cosmic title, including "Universe" and "The Milky Way"). 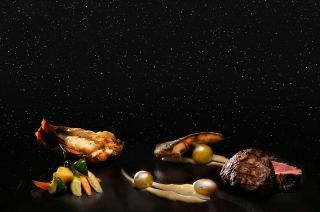 The space-rock-infused steak sauce obtains its authentic asteroid flavoring by incorporating "Meteorito" wine, a cabernet sauvignon made in Chile that is steeped with a 4.5-million-year-old, 3-inch-long (8-cm) meteorite. "What was really interesting to me was the idea of taking influences from what I saw and ate up there and getting the chefs to take it to the next level," the astronaut said. "Some of the ideas we have been playing around with are weightlessness, extreme temperature, fluid dynamics and darkness and luminosity." To that end, the meal includes such dishes as cantaloupe and watermelon "molten sun" gazpacho, lime caviar stars, and chocolate and mango "asteroids." The outdoor dining experience is paired with the chance to view the actual stars. "Taste the Stars" guests are led in a stargazing session by an expert guide. The Four Seasons Resort's secluded Pacific Coast setting makes it one of the best stargazing locales in the world, according to Travel + Leisure magazine. The nation is one of the few places above the equator where the Magellanic Clouds, two galaxies first identified by Ferdinand Magellan in the 1520s, are visible. "Costa Rica, it truly is one of the best places on the planet to see the stars," Chang Diaz said. "The only place you're going to get a better view is up here [in space]." Chang Diaz, when he is not reinventing space food, leads the Ad Astra Rocket Company, which is dedicated to the development of plasma rocket propulsion. In 2012, he was inducted into the U.S. Astronaut Hall of Fame, and most recently, was honored by the Explorers Club in New York City on March 15. The "Taste the Stars" dining experience exclusively at the Four Seasons Resort Costa Rica must be reserved three days in advance. The meal costs $195 per adult and $100 for children. For more about the "Taste The Stars" experience, see the Four Seasons Resort Costa Rica website at www.fourseasons.com/costarica. Click through to collectSPACE.com to watch Franklin Chang Diaz describe the “Taste The Stars” dining experience at the Four Seasons Resort Costa Rica.